The skin acts as a sense organ because the epidermis, dermis, and the hypodermis contain specialized sensory nerve structures that detect touch, surface temperature, and pain. These receptors are more concentrated on the tips of the fingers, which are most sensitive to touch, especially the Meissner corpuscle (tactile corpuscle) (Figure 5.2), which responds to light touch, and the Pacinian corpuscle (lamellated corpuscle), which responds to pressure and vibration. Merkel cells, seen scattered in the stratum basale, are also touch receptors. In addition to these specialized receptors, there are sensory nerves connected to each hair follicle, pain and temperature receptors scattered throughout the skin, and motor nerves innervate the arrector pili muscles and glands. This rich innervation helps us sense our environment and react accordingly. The integumentary system helps regulate body temperature through its tight association with the sympathetic nervous system, the division of the nervous system involved in our fight-or-flight responses. The sympathetic nervous system is continuously monitoring body temperature and initiating appropriate motor responses. Recall that sweat glands, accessory structures to the skin, secrete water, salt, and other substances to cool the body when it becomes warm. Even when the body does not appear to be noticeably sweating, approximately 500 mL of sweat (insensible perspiration) are secreted a day. If the body becomes excessively warm due to high temperatures, vigorous activity (Figure 5.3a), or a combination of the two, sweat glands will be stimulated by the sympathetic nervous system to produce large amounts of sweat, as much as 0.7 to 1.5 L per hour for an active person. When the sweat evaporates from the skin surface, the body is cooled as body heat is dissipated. 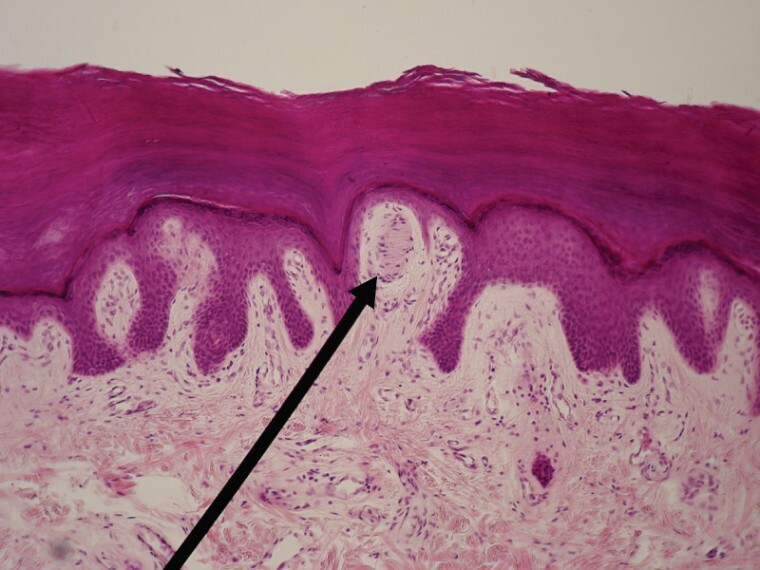 In addition to sweating, arterioles in the dermis dilate so that excess heat carried by the blood can dissipate through the skin and into the surrounding environment (Figure 5.3b). This accounts for the skin redness that many people experience when exercising. When body temperatures drop, the arterioles constrict to minimize heat loss, particularly in the ends of the digits and tip of the nose. This reduced circulation can result in the skin taking on a whitish hue. Although the temperature of the skin drops as a result, passive heat loss is prevented, and internal organs and structures remain warm. If the temperature of the skin drops too much (such as environmental temperatures below freezing), the conservation of body core heat can result in the skin actually freezing, a condition called frostbite. The epidermal layer of human skin synthesizes vitamin D when exposed to UV radiation. In the presence of sunlight, a form of vitamin D3 called cholecalciferol is synthesized from a derivative of the steroid cholesterol in the skin. The liver converts cholecalciferol to calcidiol, which is then converted to calcitriol (the active chemical form of the vitamin) in the kidneys. Vitamin D is essential for normal absorption of calcium and phosphorous, which are required for healthy bones. The absence of sun exposure can lead to a lack of vitamin D in the body, leading to a condition called rickets, a painful condition in children where the bones are misshapen due to a lack of calcium, causing bowleggedness. Elderly individuals who suffer from vitamin D deficiency can develop a condition called osteomalacia, a softening of the bones. In present day society, vitamin D is added as a supplement to many foods, including milk and orange juice, compensating for the need for sun exposure. In addition to its essential role in bone health, vitamin D is essential for general immunity against bacterial, viral, and fungal infections. Recent studies are also finding a link between insufficient vitamin D and cancer. Chapter 5. Authored by: OpenStax College. Provided by: Rice University. Located at: http://cnx.org/contents/14fb4ad7-39a1-4eee-ab6e-3ef2482e3e22@7.1@7.1.. Project: Anatomy & Physiology. License: CC BY: Attribution. License Terms: Download for free at http://cnx.org/content/col11496/latest/.